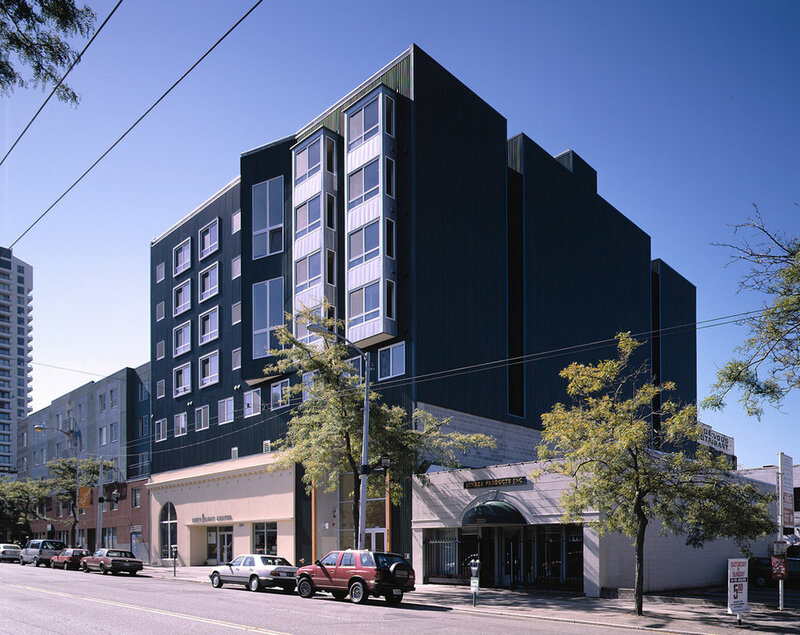 Traugott Terrace provides housing for individuals with very low incomes - 38 permanent housing units and 12 transitional housing units - in downtown Seattle’s Belltown neighborhood. The housing broadens the services of the co-located Matt Talbot Center, which offers programs to address substance abuse and addiction. The new structure was constructed above the existing Matt Talbot Center and within its adjacent 30′ wide parking lot. fixtures, a heat recovery ventilator and a highly efficient gearless traction elevator. Building materials were chosen for their recycled content and low toxicity, and wood from sustainably harvested sources was used for framing and sheathing.